Salmon is a menopause must. A great source of those essential omega-3 fatty acids and also high in protein. ight soy sauce is very low in saturated fat and cholesterol and includes many other vitamins and minerals that are beneficial for our health. Finally, the fresh ginger is an effective anti-inflammatory and antioxidant agent that may help ease any aches and pains. This easy recipe can be prepared in advance, left to marinade and takes moments to cook. Great with salads, try it with our Kimchi or steamed veggies. Please buy your salmon from a sustainable source. Whisk together soy sauce, oil, lemon juice, garlic, shallots, ginger, and pepper in a shallow bowl. Add salmon, turning to coat, and marinate, covered, at cool room temperature for an hour, or in the fridge if marinating for longer. Put an oven rack in middle position and preheat to 200 degrees for a fan oven. 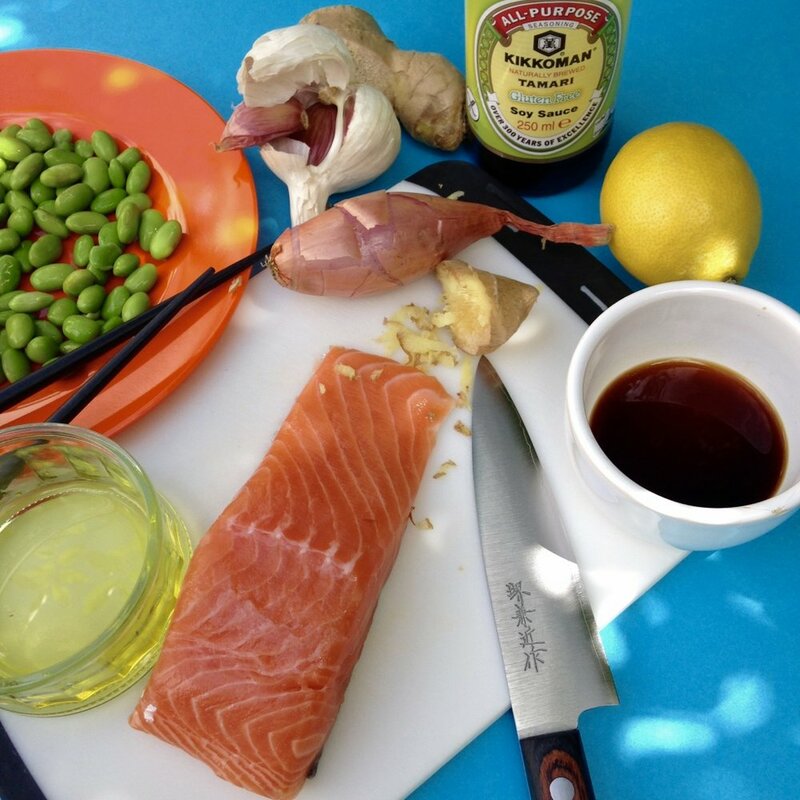 Remove salmon from marinade, don’t discard the marinade yet. Place each salmon in a section of foil, skin sides down, place a lemon slice on top of each with a small knob of butter, fold up the edges of the foil and add a teaspoon of the remaining marinade, loosely wrap up each salmon in a parcel and ensure all edges are sealed. Bake on a baking sheet until just cooked through, about 12 minutes, the salmon should be moist and not dry. Lift salmon from skin with a metal spatula and transfer to a plate (discard skins).